We are showcasing this beautiful and hard-working living roof as as our Featured Project in honor of the International Roofing Expo – IRE being held in Nashville next week. Running from February 11 to 13, IRE 2019 is hosted at the Music City Center within its gracious exhibit hall and concourse. If you are attending IRE, please join me and my fellow awesome colleagues Moderator Joanne Rodriguez, Mary Ann Uhlmann, and Elizabeth Hart Morris for our TU16 “Vegetated Roofing: A 10-year Perspective on Growth and Opportunities” on Tuesday, February 12 from 9:30 am – 11:00 am, Room 204. Read all about our 90-minute session and power panel! 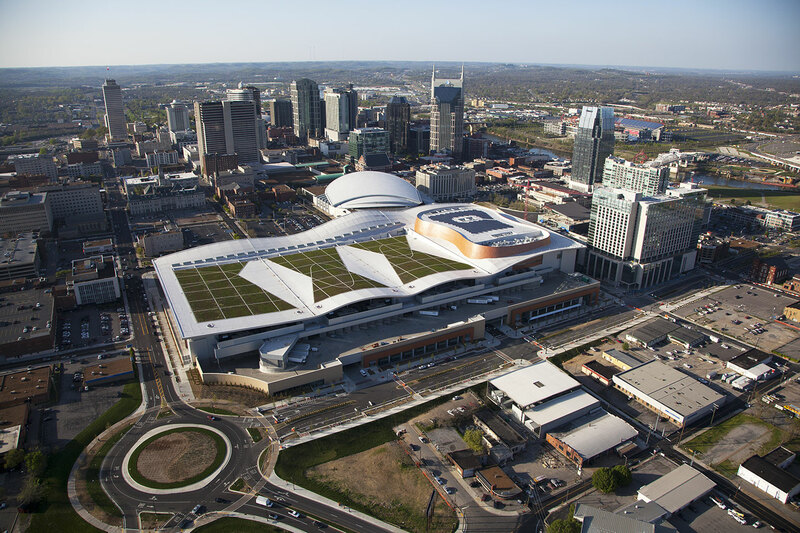 Designed by TVS, the LEED Gold certified Nashville Music City Center (or MCC) is an iconic 1.2 million square foot convention center spanning three city blocks. 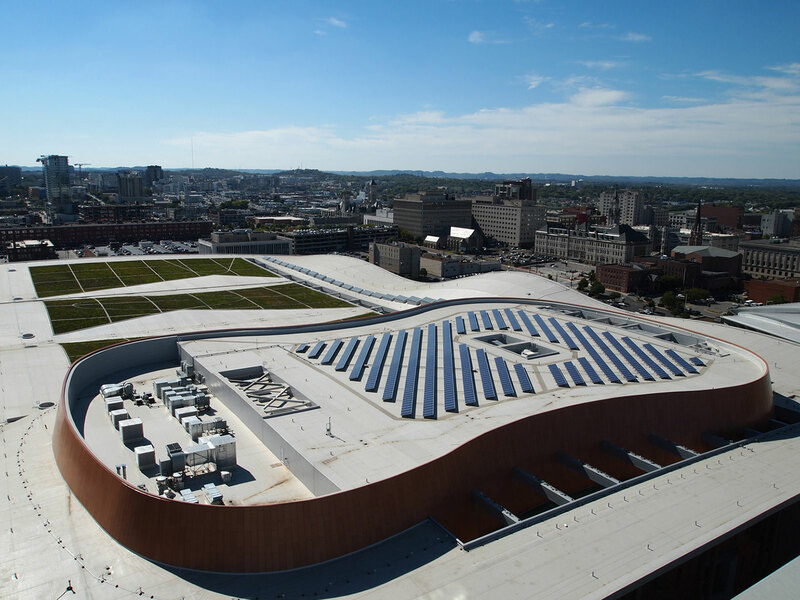 Five stories high, the wavy roof has three independent green roof sections, laid out in its signature green diamond pattern to mimic the area’s rolling hills. The 191,000-square-foot greenroof was designed for urban heat island reduction and stormwater retention, built to handle a 2.6-million-gallon stormwater offset. The greenroof design represents the frets and body of a guitar—including an array of 845 solar panels incorporated into the design of the guitar body. According to LightWave Solar, the MCC’s carbon offset over 25 years is equivalent to planting 3,750 acres of trees. The MCC is protected by a waterproofing membrane from Sika Sarnafil. 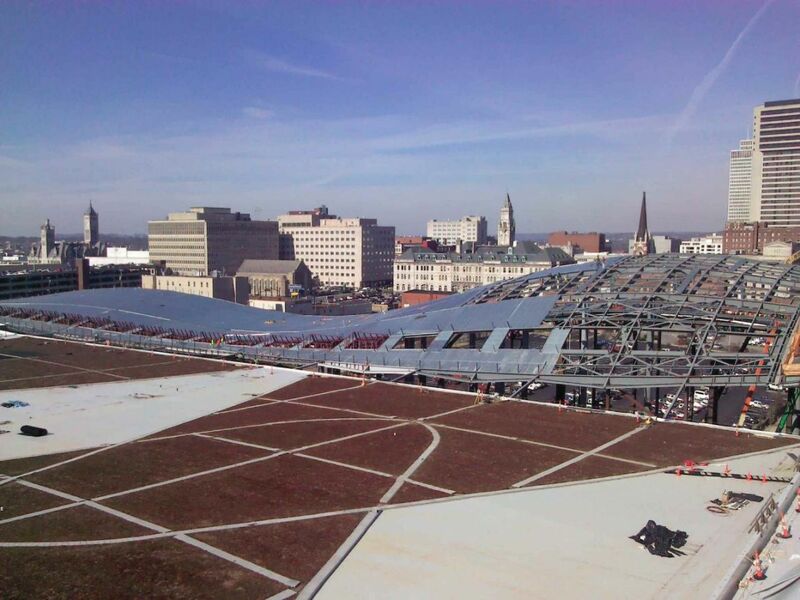 Although sections of the roof have zero slope at the crests and valleys, the green roof has undulating surfaces with pitches ranging from 16 – 25%. 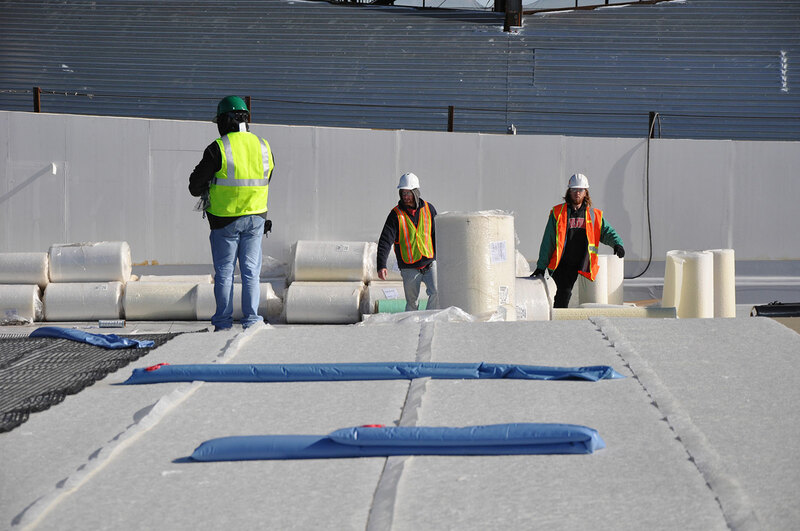 A capillary fabric for moisture control was installed under the shallow rooflite® Extensive MCL growing media depth and Xeroflor‘s Enkadrain®/W 3601 was used as an underlayment and drainage system. With a 65-foot difference in elevation, a geogrid slope stabilization was required to support the media. 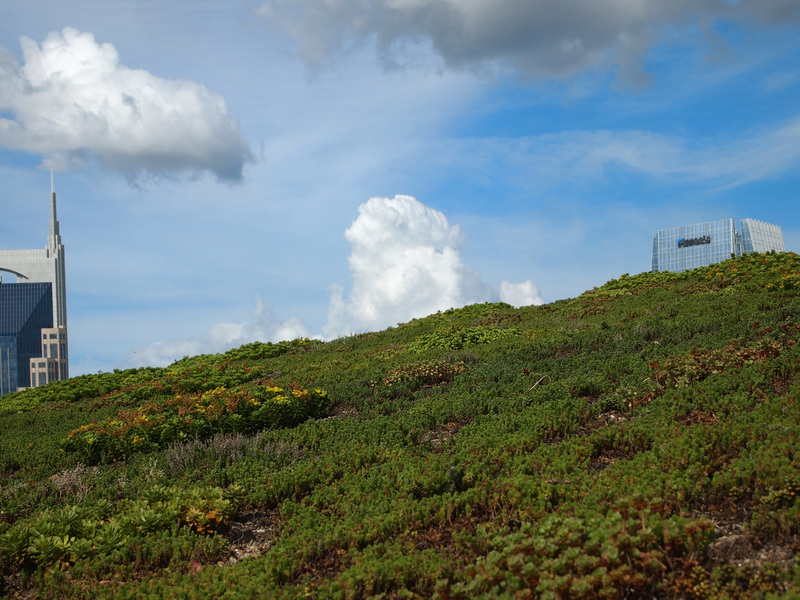 Pre-vegetated sedum mats from Sempergreen were specified using 14 plant species along with a geogrid for wind stabilization. The extremely lean 2.5-inch thick green roof profile of 6 structural layers weighs in at only 17.5 pounds per square foot at its heaviest and was specifically designed for the MCC by Roofmeadow. A 360,000 gallon rainwater collection tank stores rainwater from the roof which is used to irrigate outdoor landscaping and flush the hundreds of toilets in the building. 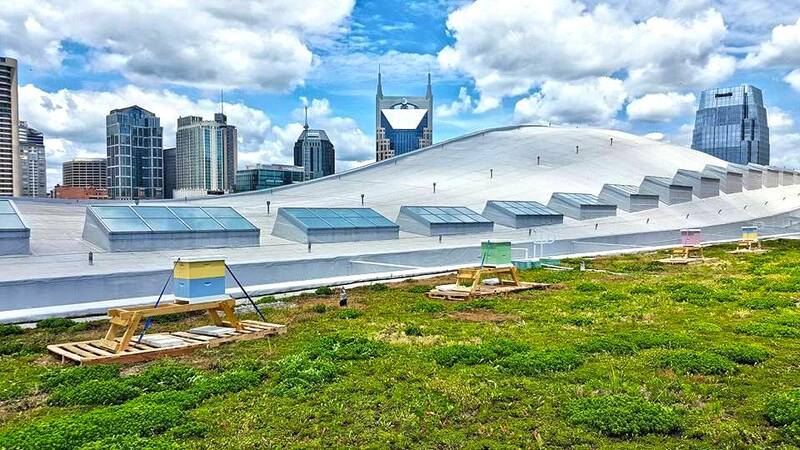 The MCC also supports bee hives on its 4-acre greenroof to help the bee population in Nashville flourish, provide pollinators to the many green downtown spaces, and produce honey for use in their kitchen. 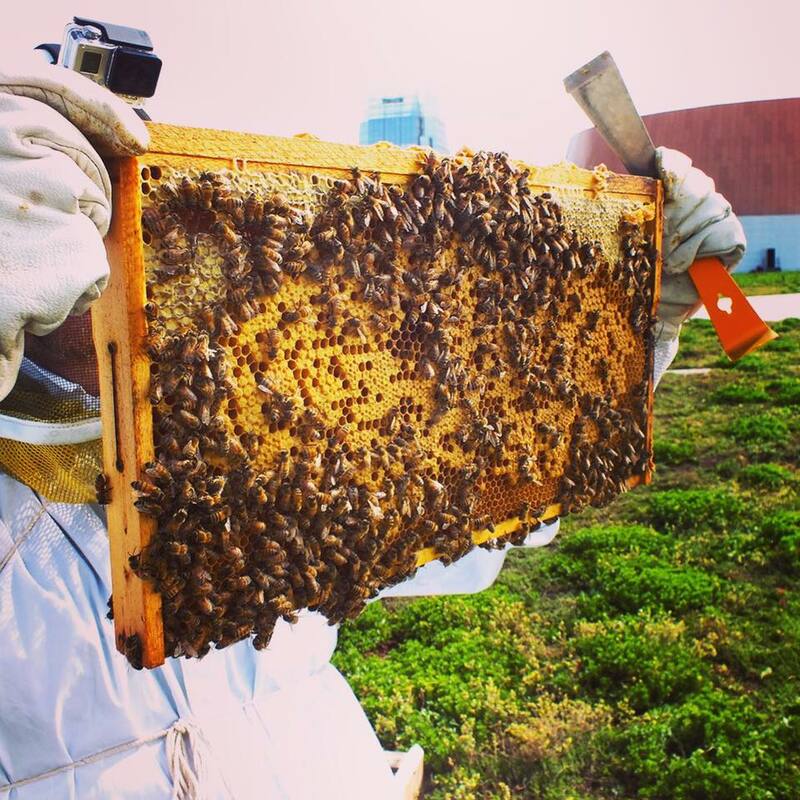 The hives can produce up to 200 pounds of honey each year from approximately 100,000 bees. 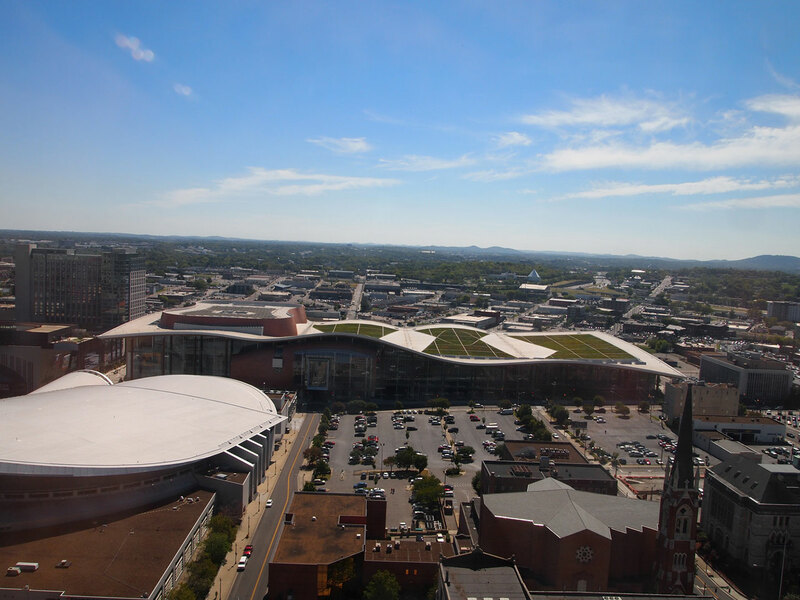 Installed and maintained by Greenrise Technologies, the Music City Center green roof represents the ultimate fusion of aesthetics and engineered performance. View the Nashville Music City Center project profile to see ALL of the Photos and Additional Information about this particular project in the Greenroofs.com Projects Database. 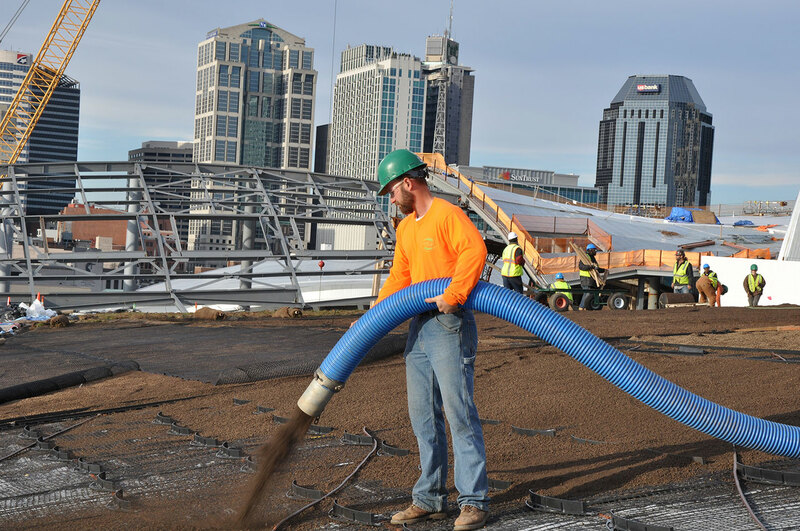 Watch the Nashville Music City Center Featured Project Video above or see it on our GreenroofsTV channel on YouTube. Did we miss your contribution? 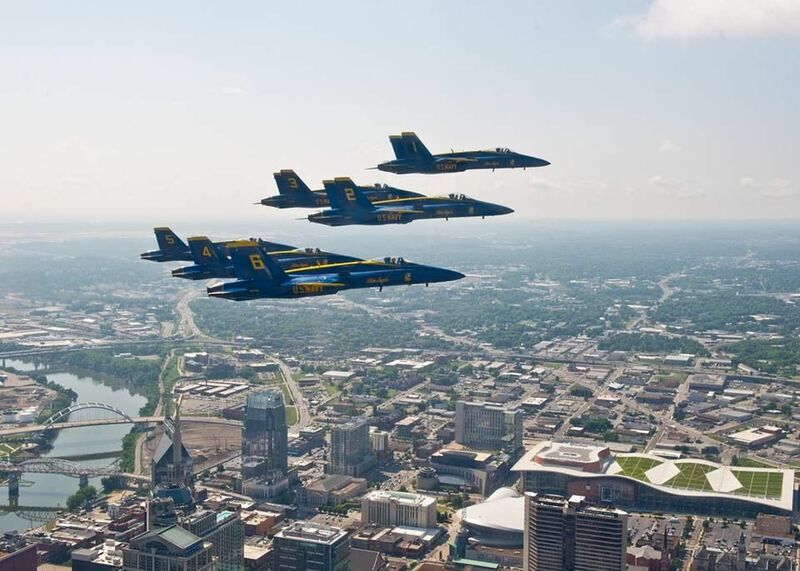 Please let us know to add you to the Nashville Music City Center profile.